Illinois winters are generally very long and cold… During those frigid winter months I like to start making my plans for the upcoming season as cabin fever generally sets in very quickly! This includes picking out 2 or 3 big trips paired with scouting new potential venues for the upcoming season along with checking in on the venues I’m already familiar with. The amazing thing about carp fishing in the US is the abundant amount of mostly untouched venues we have available to explore and wet a line in! Anyway, back to my review! To kick off 2018 I decided I would make the 17 hour drive down south to Austin, TX to fish ‘The ATC’ (Austin Team Championship) in March with 3 of my closest fishing companions from our ‘Mid-state carpers’ group. I need to give these guys a shout out as there are 15-20 of them that are very close to me, we fish together throughout the year in the state of Illinois and in many of our neighboring States. I wouldn’t have most of these stories without these guys! I also booked Dale Hollow Lake in Tennessee for the first week of May, this was a must after seeing some of the catches and videos put together by our predecessors. In December of 2017, Dave Ash based out of Michigan reached out to me about planning a social with my Illinois group and his west Michigan group of guys; with a little negotiating and planning around our respective, busy schedules, we set a date of mid-June and a location of Holland, Michigan. So my big 3 trips were all set very early in the year. For the ATC, myself, my partner Antony Hartung along with our other team in the form of Chad Bettisch and Tony Donato set off on our long trip after months of planning and excitement. Once we got down to Austin I got to meet a lot of the faces I had only seen on social media previously. I cannot stress enough how well organized this tournament is, these guys know how to put together an event! From a fishing aspect, it could have gone a bit better but that’s why it’s called fishing not catching. As a team, the only fish that counted in the overall standings was a 22lb 10oz common that I landed in the first hour of the tournament, other than a few other species caught over the next 23 hours that was it for us. Once we finished the tournament, directly after the awards ceremony the 4 us went straight down to the first street bridge to maximize our stay and were able to put a few more fish on the mat. This is definitely be an event I will participate again in the future! Next up was Dale Hollow, right off the bat, the pictures and personal accounts from others cannot do this venue justice until you see it for yourself, I’ve traveled a lot, and this place is one of the most scenic places I’ve had the pleasure to visit let alone fish. Once setup I had four full days at my disposal as I had driven over night to arrive at daybreak the following day. Just as a side note at the beginning of the year I had set myself a few personal goals, them being to catch a US mirror as they are tough to come by in Illinois, and to land a thirty. Needless to say this venue ticked all of my boxes. Over the Next 4 days I went on to land multiple personal bests with most of the fish caught being mirrors. What also made this a special trip was that I got to fish with my dad.He lives about 4 hours south of me so we planned to meet up on the bank with him coming down a day or so later and setting up next to me. The morning of day 3 is one that will forever be etched in my memory as my dad and I both joined the 30 club within an hour of each other, he landed his first on one of my rods that was part of a double run with me landing a 22+lb mirror and him landing a low 32 mirror. Within the next hour and a half I added 3 30’s myself with the pick of the bunch being a 32.8 mirror, it was an amazing feeling that I hope I get to replicate again in the future with a very special man to me. 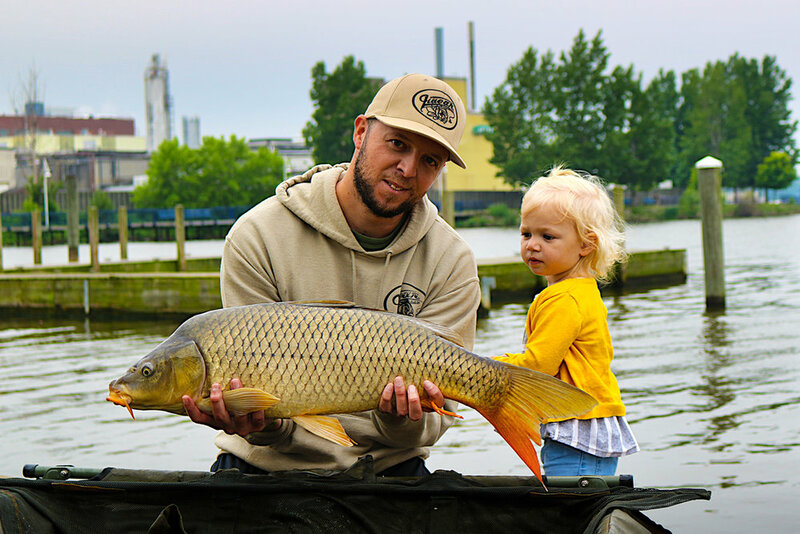 Next up was Michigan, now, anyone that carp fishes that is married with young children, understands you need a hugely understanding better half to allow you to put so much time in to a hobby. It wouldn’t be possible without my wife, Correna being so understanding! So for this trip I brought her a long with my young daughter Charlotte to enjoy this experience. We fished Kollen park in Michigan, I say we as we had about 20 of us between our Illinois group and the Michigan group. This was a pure social event to meet new people and fish with them. I had a successful day myself landing a double figure amount of fish; most of them in the teen size range, with one I lost after 10 mins or so of playing that had gotten behind the boat dock feeling significantly bigger than anything else I had caught. 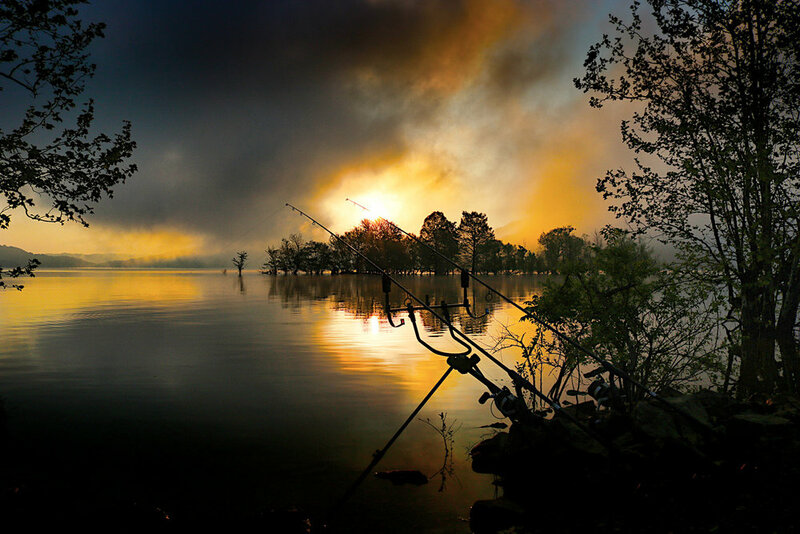 Well, it wouldn’t be fishing without a ‘one that got away story’! it’s what keeps us going back! I feel myself to be a hugely blessed individual from a fishing standpoint that I had the year that I did with the people I got to spend it with. Best of luck to everyone in 2019! Newer PostIf You Feed Them In The Right Area... They Will Come!